Purchasing recorders – I sell recorders every year. At my old school, where I taught for 10 years, everyone purchased their own recorder…. Each year the school would provide a recorder for maybe 5-6 students who didn’t have the means to purchase their own. At my current school where I have taught for 3 years, I have never had more than 30% of my students purchase recorders, which leaves the school to provide the other 70%. I am glad to say that because of donorschoose.org I have been able to acquire 2 full grade levels worth of recorders. This means that everyone in 4th and 5th grade can be assigned a recorder for their individual use throughout the entire school year and I don’t have to spend my time disinfecting recorders in between classes….. My older grades typically have 6 homerooms. I am happy to say that this summer donorschoose.org provided an additional set of recorders so now instead of having 5 colors, I will have 6….. this will make things MUCH easier! When ordering recorders from donorschoose.org you are limited to the selection found with the woodwind brasswind company as they are the sole music vendor for donorschoose.org. I am a big fan of both the Peripole Angel recorder and the Aulos soprano recorder, but in this case I will admit that the ease of organizing the recorders by color outweighed my preference in tone quality. Assigning Recorders: I have a Promethean board. So, as soon as I get my class rosters in the fall I put the names of my students into a flip chart like this. I project it up on the wall. The number next to their name is their recorder number. Since being at my current school I have had a few classes larger depending on how the block rotation works, AND I am at a school with a high mobility rate….. So, keeping this chart as a flip chart is VERY handy. As we use the flip chart and as students move away, I can either write the corrections right on the board, or type them quickly. When my half-time co-teacher and I were both using recorders, it was easy to print out. 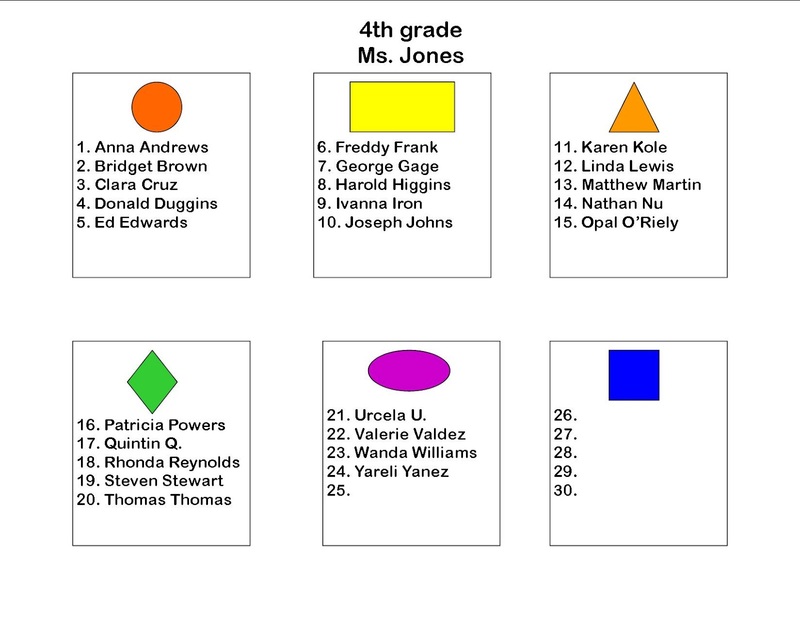 At least for the beginning of the year, before I’ve got the class dynamics figured out, this chart also serves as a way to organize students into small groups for centers….. My favorite part is that everyone can see the chart, so it makes passing out recorders so much faster! It wasn’t long before my students had not just memorized their own numbers, but they also knew the everyone else’s. Labeling Recorders: I’m a big fan of using what is on hand and last fall, THESE were the labels I had on hand. As you know, we have no way of knowing for sure WHO is actually going to be at school on the first day, so all I did before school started was to make sure that each recorder of a particular color had a sticker with a number (1-30). I placed the sticker on the back underneath the head joint. THEN when the students showed up and it was time to actually play, I wrote their first name and last initial o the sticker with a fine tip sharpie. I found through the year that I liked the large round stickers because since they didn’t wrap around the entire recorder, they were out of sight out of mind and I didn’t have anyone pulling them off. Storing Recorders: THIS container is the perfect size for a class set of recorders. I tape the teachers name in book tape on the outside. My favorite part about these bins is how much faster students can put away their recorder when they just have to dump them in the box….. It means that we can keep playing for a little longer because the recorders are so easy to put away. I have two of these shelves. I keep ALL of 4th grade on these two shelves in the Sterilite containers. 5th grade fits in my Wenger cabinets. Recorder Captains: I assign two or three students to serve as Recorder Captains. I’ve found that it is easier to work into a routine if the same students serve as captains for a longer period of time. The students who do this job get very fast. Eternal Optimism – Things I hope to accomplish for the fall. I hope to add 9×12 envelopes labeled with shapes to keep our recorder music. I have a class set of method books, but often the pieces that we actually prepare for performance are from Music Express or Music K-8…. so I end up with lots of loose recorder music running around the room. If I add the envelopes, THEN it would be easier for students to find their music. Since we take notes on our recorder music, I think I like that idea……. I’m an eternal optimist about what I believe I can get done….. If I ACTUALLY get this accomplished, I will certainly post my success, because I will be somewhat surprise.